Installing air conditioning in a home - With global warming there is little doubt that UK summers are getting hotter. If you consider some European countries and the US you will see that Air Conditioning in homes is becoming more and more popular. Its strange when you think that often our workplaces are air conditioned, most new cars come with air conditioning as standard – yet our homes are not. DIY fit air conditioning has started to become more popular. B&Q for example have now started to offer a line in self fit air conditioning. The unit we used is a split unit. It contains an internal fan and control unit designed to be installed at high level in the room and an external cooling / fan unit. These units are fairly simple to fit, they claim that if you can plumb in a washing machine then you should be able to fit this. Think about location – you only get 4m of hose to connect the parts so you should really think about this. Make sure the external unit is not very near to your neighbours windows as they may not appreciate the fan noise in the dead of night next to their bedroom window. Make sure that you run the drain hose under the other hoses as if it is higher then you will get wet walls. Make sure you have a power socket near the internal unit. If you are running the hoses down a wall consider covering them up with a drain pipe to make them less conspicuous. If you do this make sure you run the drain pipe parallel to the others in your property to avoid it sticking out like a saw thumb. Filling the hole – we used filler foam. The photo’s below show some of the key parts to the split air conditioning system. We used the B&Q home brand system but there are plenty of DIY installed air conditioning systems to consider. Side view of the external air conditioning unit. You can see that the gas and drain hose has been hidden in a drain pipe. 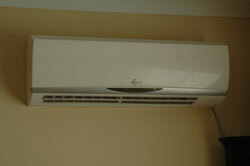 Picture of the external air conditioning unit mounted on the optional bracket. This is only needed if you want to mount above ground. If you plan to install on an upstairs wall that you have any planning consent required. Picture showing the internal part of the air conditioning unit installed on an external wall. Note in this installation the pipes fed through directly behind the unit. The lead you can see on the bottom right hand corner is for the power lead. It is probably worthwhile installing a fused spur for this. However, you should get a qualified electrician to do this in line with current regs. Take a look at the links below for deals that are available on DIY air conditioning systems. You will probably find the best deals online with the added benefit of having them delivered. These units can be large specially with the packaging and boxes. You need to ensure you get the correct power air conditioning system based on the size of the area you wish to cool.